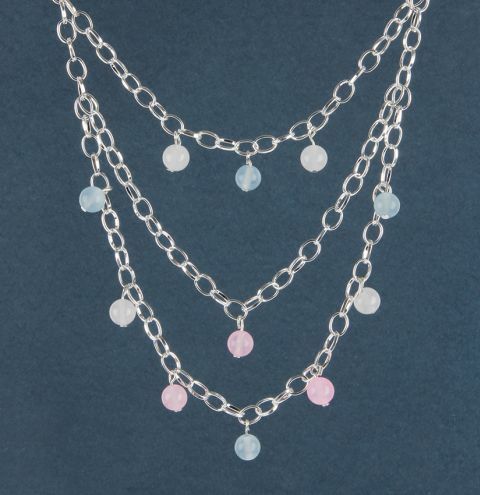 Learn how to make the Bubblegum Necklace using a mixture of delicate dyed jade beads and a shining silver chain. Cut a length of chain measuring 20". Attach a lobster clasp to one end of this. Make 11 bead charms by threading individual jade beads onto headpins. Trim and loop the headpin above the bead. Make 4 blue jade charms, 3 pink and 4 white. Find the halfway point of your chain and attach a blue jade charm. Count 4 links away on either side of this bead and attach a white bead charm to each of the 4th links. Cut another length of chain measuring approx 8". Count 8 links outwards from your white beads on your first chain. Attach your new length of chain to these 8th links. At the centre point of this second chain, attach a pink bead charm. Cut another length of chain measuring approx. 9". Where you attached the previous chain, count down this chain 5 links on either side. Attach your last length of chain to these points. Check your necklace hangs correctly. Finally find the halfway point of this lowest hanging chain. Count 5 links in either direction on the chain and att a pink bead on both sides. Repeat this again and add a white bead on each side and then the remaining blue beads.